Antennas on chip; probabilistic programming; inkjet-printed liquid metal. In what is being called the missing piece of the puzzle of electromagnetic theory, a team of researchers at the University of Cambridge have figured out one of the mysteries of electromagnetism, that they believe could allow the design of antennas small enough to be integrated into a chip. These ultra-small antennas – the so-called ‘last frontier’ of semiconductor design – would be a massive leap forward for wireless communications. The researchers said electromagnetic waves are generated not only from the acceleration of electrons, but also from a phenomenon known as symmetry breaking. In addition to the implications for wireless communications, this discovery could help identify the points where theories of classical electromagnetism and quantum mechanics overlap. The purpose of any antenna, whether in a communications tower or a mobile phone, is to launch energy into free space in the form of electromagnetic or radio waves, and to collect energy from free space to feed into the device. One of the biggest problems in modern electronics, however, is that antennas are still quite big and incompatible with electronic circuits – which are ultra-small and getting smaller all the time, they said. For further details on this work including how electromagnetism and quantum mechanics cross over and join up, click here. The team said this discovery will also help in the development and implementation of the Internet of Things in which billions of devices are required, and the ability to fit an ultra-small aerial on an electronic chip would be a massive leap forward. To make machine-learning applications easier to build, computer scientists have begun developing so-called probabilistic programming languages, which let researchers mix and match machine-learning techniques that have worked well in other contexts. In fact, in 2013, the U.S. Defense Advanced Research Projects Agency launched a four-year program to fund probabilistic-programming research. Towards this end, MIT researchers will demonstrate in June that on some standard computer-vision tasks, short programs — less than 50 lines long — written in a probabilistic programming language are competitive with conventional systems with thousands of lines of code. They said this is the first time they’re introducing probabilistic programming in the vision area. The hope is to write very flexible models, both generative and discriminative models, as short probabilistic code, and then not do anything else. General-purpose inference schemes solve the problems, they said. In in effort to mass-produce electronic circuits made of liquid-metal alloys for “soft robots” and flexible electronics, Purdue University researchers have shown how inkjet-printing technology can be used. They said elastic technologies could make possible a new class of pliable robots and stretchable garments that people might wear to interact with computers or for therapeutic purposes. But for this to happen, new manufacturing techniques must be developed before soft machines become commercially feasible. Their goal is to create stretchable electronics that might be compatible with soft machines, such as robots that need to squeeze through small spaces, or wearable technologies that aren’t restrictive of motion; conductors made from liquid metal can stretch and deform without breaking. They describe a potential manufacturing approach focuses on harnessing inkjet printing to create devices made of liquid alloys. 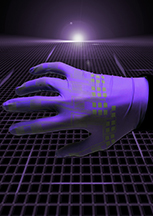 This process — called called mechanically sintered gallium-indium nanoparticles — allows flexible and stretchable conductors to be printed onto anything, including elastic materials and fabrics.